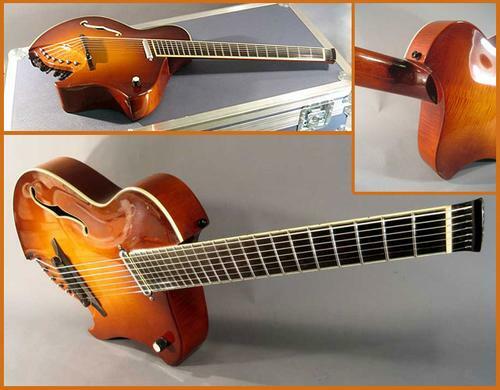 Archtop guitar meets modern features in this unique multi-scale instrument by Koll Guitars. The RE7 combines ergonomics, fanned frets, archtop construction and even its own approach to headless guitar tuning. The RE7’s ebony fretboard spans a scale length of 24.635″ on the treble side to a 26″ length on the bass side and incorporates a very subtle compound radius. Despite its unusual appearance, the guitar is built using traditional arch top construction including a sitka top, carved maple back, hand bent sides, mahogany blocks. DAG points out that while it’s built as an electric guitar, the guitar still has excellent acoustics due to its archtop construction. Because an off the shelf headless bridge system wouldn’t work with the instrument’s archtop nature, the RE7F uses an archtop bridge combined with conventional locking Sperzel tuning keys. To find out more on the Koll Guitars RE7F, visit its page on Destroy All Guitars. Thanks to Destroy All Guitars and Cliff Cultreri for information on the instrument as well as permission to use the photos seen above. Very nice. Unfortunately, however, I don’t think Koll is making these anymore (see his website). I heard it was a great guitar, though (I’m in Southern California, home of the great Ron Eschete!). I see what you mean, Marc. I’m not sure if that’s old information. That’s actually been up for a while, if I’m not mistaken. Meanwhile, this is guitar #300 for Soll Koll and was completed at the end of December 2007. Let me see what else I can dig up. I fell in love with this guitar when I first saw photos of it here on your site and it had something to do with inspiring the overall design of the guitar that Rick Canton is building for me currently. When I saw it here again this morning in a much more comprehensive article I checked out Cliff’s “Destroy All Guitars” site and was truly amazed by the wide range of luthiers that he represented. I contacted him and by the end of the day the guitar was mine. I have to say that Cliff is one of the nicest people I have had contact with in the business and I can recommend him as a conduit to some truly amazing artists. I also want to thank Saul Koll for having the imagination to build this guitar. BTW – I think it is Saul’s 300th guitar, not 400th. Al, that is fantastic! You bought the guitar! It’s a real beauty and I’m pleased to have the opportunity to feature it as well as help a reader make such a great connection. I’d love to get your feedback once you have it in hand. I’m sure everyone will enjoy a first hand account. I will be glad to give feedback on the guitar after I have spent some time with it. I have to say I am a little concerned about the single coil lipstick pickup in a guitar of this style, but something tells me that Saul knows what he’s doing and I won’t be disappointed. I would have liked to see a Lollar Charlie Christian pickup custom made for the 7 string width if I was going with a single coil. I bet Jason would have made something really special for a guitar like this. I sure have a lot more guitars now! Well the RE7F arrived yesterday and I got a chance to play it a bit last night. First off I have to say that Saul Koll builds incredible guitars. This was the first Koll I have ever played. It was just plain perfect right out of the flight case. The tone from string to string up and down the fretboard was very even. The feel was the same. I have close to 25 guitars and have played many more and I think this is the most well built guitar I have ever had in my hands. I wish that my playing deserved the workmanship that Saul put into it. The multi-scale “fanned” fret board is so easy to get used to! I thought that this would be a problem, but actually never was. I felt comfortable immediately and never had to think about the difference. The harmonics chime more than any other guitar I’ve played. The 7th string was a bit more of a challenge for me and will take some getting used to. Wonderful and thank you for the update! How do you find the multi-scale neck from an ergonomics perspective? Is there a fretting hand position that you find it more appropriate with? It’s like you don’t even notice that there is a difference. When I am barring a chord and I happen to look at my hand position it seems to just “be” at he same angle as the frets. I have been trying to use my thumb directly behind the neck. I haven’t played as much in the higher positions past the 14th or so fret so I am not sure about how that will be in the long run. Robert, where are you located? If we live at all close I would be happy to let you play it. I know that PJ Doland lives very close to me. I am in the Washington DC area. You can respond directly to my e-mail address if you prefer. This is the second time that i see an headless archtop on the web.